Last year some of my favorite pet bloggers participated in the Pet Blogger Challenge but unfortunately I learned about the challenge a little too late to jump in and participate. This year, I’m ready for it and I’m actually a few days ahead of schedule. 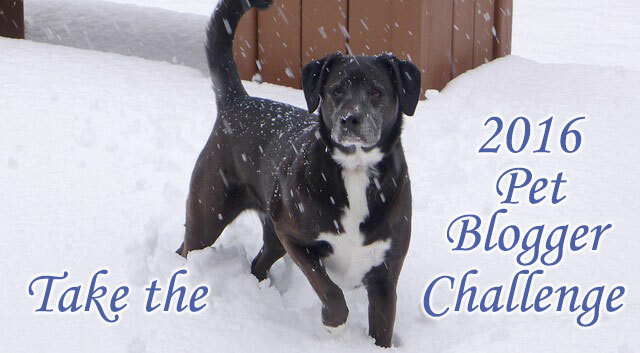 If you’re a new blogger or haven’t heard of the challenge before, it’s an annual blog hop sponsored by GoPetFriendly.com that takes place each January. Pet bloggers answer ten questions about their blog as a way to share their accomplishments and challenges from the previous year. It’s also a fun way to get to know your fellow bloggers a little better and discover some tips to help make your blog more successful. For my non-blogging readers, thanks for bearing with an article that’s more about blogging than dogs and for my blogging buddies, I hope you decide to participate in the blog hop which starts Saturday, January 9th and runs through Monday, January 11th. Just click the image below to learn more or join the hop via the code at the bottom of this post. My answers to the 2016 Pet Blogger Challenge! 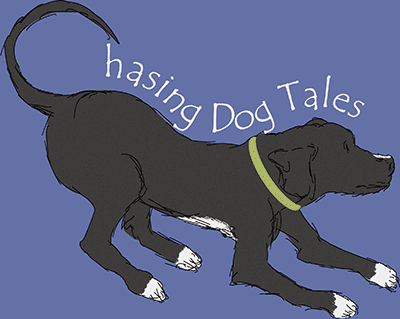 I’ve been blogging for about a year and a half and my blog covers a range of topics about dogs. You’ll find lots of articles about dog behavior and training, tips for keeping your pup healthy and a few reviews of my favorite dog products. I’m most proud of being able to reach more people in 2015. I saw a significant increase in traffic during the past year and a higher level of engagement when visitors came to the blog. Which of your blog posts was your favorite this year and why? My favorite post was Why Does My Dog Greet Me With a Toy? – I’ve discovered that some of my best performing articles have been about quirky dog behavior or things I wonder about but don’t necessarily have an answer or explanation for. These types of posts generate a higher level of engagement and it’s always interesting to read other people’s comments and perspectives. What is one thing you’ve done in the past year that has brought more traffic to your blog? Being more active with social media certainly has helped, especially via Twitter and Instagram but most of my traffic comes from people using search engines to find an answer to a question or problem. Yes, it’s all about that darn SEO! Which of your blog posts got the most traffic this year? Why do you think it was so popular? By far, my most popular post was How to Stop Your Dog from Getting Into the Trash. It certainly made me feel better about our little trash hound who once again this past year got into the trash when I forgot to remove the can before leaving the house. You can tell she felt bad about her misadventure, but I assured her that it was my fault and judging by all the hits this post generates, she’s not alone. What is one blog that you read religiously – other than your own – and what makes you such a devoted reader? Reading articles by my fellow bloggers has turned out to be one of my favorite parts of blogging, so this question is the hardest one to answer. I’ve developed some great friendships along the way but what keeps me coming back to a particular blog is if I learn something new, gain a new perspective on a topic or have a laugh or two along with the writer. I wish I could list more blogs here but I’m already over the limit with these three talented ladies. K9sOverCoffee by Barbara Rivers – A terrific blog loaded with articles and tips for keeping your dog healthy. I love how devoted Barbara is to keeping her pups (Buzz and Missy) fit, healthy and happy. Whether a post is about raw diet feeding, exercise, training or healthy products for your dog, I always learn something new here and that keeps me coming back. That Mutt by Lindsay Stordahl – That Mutt is one of the first blogs I started following and because Lindsay’s been blogging strong since 2007, she’s certainly doing something right! As a dog walker and blogger, her no-nonsense, honest approach to topics is refreshing and there’s always something new to be learned or an interesting perspective on a topic being shared and discussed in her comment section. Her dog Ace looks and sounds like a male version of Haley, so I can’t help but love him! Puppy Leaks by Jen Gabbard – How could you not fall in love with Jen’s dog, Laika? She writes about her experience with Laika, the challenges they’ve faced and their success through positive reinforcement training. I really appreciate her articles on science and dog behavior and I always learn something new from the posts she highlights in her Weekly Roundup series. There are so many resources to name here (books, ebooks, websites, etc.) and of course, where would we be without Google, right? I have to give a global “thank you” to all of the writers out there who create helpful articles that solve our nagging, little blog issues and errors which seem to crop up all year long. We surely appreciate all your help! I don’t currently have any plans to monetize my blog, but for anyone wanting to make a living at blogging (or at least pay the blogging bills), there’s no better resource than the BlogPaws community for help with marketing and social media. If you’re a new blogger just getting started, it’s easy to feel overwhelmed because the truth is, there aren’t enough hours in the day to do everything we should be doing. Enjoy the small victories and accomplishments at first and celebrate each goal along the way as your traffic grows. Writing from the heart and exploring topics you’re passionate about is the best way to find your voice and draw an audience. One last piece of advice, don’t forget to give something back to others along the way. I’ve got a list of exciting post topics coming up this year and I’m hoping to stay on trend with increasing traffic and engagement on the blog. I’ll be attending the Global Pet Expo in Orlando this spring, so look for upcoming posts featuring interesting, new pet products headed our way in 2016. Is there one blogging challenge you’d like help with, or one aspect of your blog that you’d like input on? Time management is always a big issue for bloggers. Between all of the different social media platforms and blogs I like to keep up with, I often feel like I’m neglecting someone or something. I’m not a fan of automated tools that do mass sharing of posts because I like to read the articles I share, but any tips for tools or apps that help streamline routine blogging tasks would be helpful. That’s a wrap for my first Pet Blogger Challenge! It’s such a wonderful way to learn from each other, celebrate our accomplishments and gain insight into the blogging challenges we face. I look forward to reading all of the posts over the next few days and I want to give a big thank you to GoPetFriendly.com for hosting the event! Very nicely done! I may not make the challenge this year, but I certainly plan to read all those who do. Time management is certainly an area that I need to focus on – I’m a hot mess sometimes when it comes to staying on track. Looking forward to more posts from you in 2016. Thanks so much, Cathy! I guess that should be both of our New Year’s Resolutions, to have better time management. ? I’m new to the challenge, but will try to join in on Saturday or Monday. I love your answer for number 8 – celebrate the small victories. Sometimes this is challenging – especially if you have long term (big) goals that you are trying to reach, but it sure is important and a great reminder. Yes, you have to celebrate the milestones! I’m looking forward to reading your answers this weekend. ? Great answers to the questions. We are working on our post this week, but won’t post until Monday. SEO is the hardest thing for us, but we keep working at it as best as we can. Getting a blog started is tough, our first 18 months or so were pretty sad, but after finding BlogPaws, a new world opened with a new understanding for how to really promote a blog and find readers. Good luck in 2016! I agree, SEO is confusing and the algorithms change from time to time so you have to keep up with what the various search engines are looking for. Blog Paws has helped so many bloggers, even ones that aren’t looking to monetize their blog. I’m glad you’ve had such great success and I’m looking forward to reading your post on Monday! Great! Looking forward to reading your post. ? 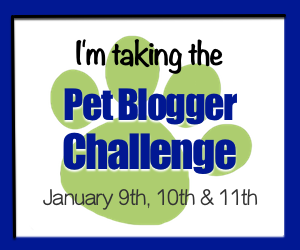 Thanks, I hope to see you in the Pet Blogger Challenge! I will be participating in the challenge again this year. I love reading everyone’s responses. You can also get great tips. I can’t wait! I’m so glad I didn’t miss it again this year, see you there M.K. ? I’m fascinated by your SEO answer. Good for you! Now that Google is doing so much in advance, putting answers to questions right on the search results page, in some cases, it’s harder than ever to cut through the clutter. Good for you for grabbing some of that traffic! I was surprised to see the Google answers show up not too long ago too. I wonder how they determine what resource to use for that. You’re right, there is a lot of noise to break through but it definitely helps to do at least the basic SEO stuff. How fun!! I am going to do it!! The hops are a fun way to meet new people!! So glad you decided to participate, Julie! See you in the hop this weekend. We’re participating in this years pet blogger challenge too! Congratulations with all your accomplishments. Your blog is one of our favorite new blogs that we’ve discovered this past year. I’m mostly managing my time, email, blog posts, social media, etc in a google spreadsheet. In the past I’ve used a few tools including Hootsuite and BufferApp. Good luck to you and the blog in 2016! Ah, thank you so much Colby! I’ve enjoyed reading your posts too and look forward to seeing your answers and getting to know more about you and your blog from the challenge. I absolutely love discovering wonderful new blogs! Thanks, Hazel! ? Think about jumping in on the action with the challenge this weekend and good luck with Happy’s little habit, lol! Thanks for the advice and for the answers. I have only been blogging for about 5 months and can use all the help I can get. You’ll love the challenge! It’s fun to create a post but even more fun to read everyone’s answers. You’ll find lots of advice and helpful tips. I’m glad you did the challenge this year! I so enjoyed getting to know you better. Thanks for sharing. I hope to see you there, JoAnn. I love your blog and all the knowledge and experience you bring to our community. Thank you for writing about this Pet Blogger Challenge – I had no idea, but will be participating ~ and I already read your answers 😉 I’ve been working on my SEO as well – and it just got me a new puppy client! Thank you also for the shoutout and for enjoying my blog – that just made my entire day, and it’s only 5:47 in the morning!! My pet sitting business has been getting more busy, so I’ll be working on getting up early several times per week in order to be able to blog/network/write comments – such as right now! Yay! I’m so glad you’re planning on participating in the challenge and you’re quite welcome for the shoutout. Congrats on your new client, it sounds like business is booming! This will be my first time going to the Global Pet Expo so it should be interesting. It’s not open to the public, but you can apply for a press pass on their website. You’ll have to let me know if you decide to go and maybe we can meet up sometime during the event. ? I better read “Why does my dog greet me with a toy?” I wonder if it applies to the reason Leo always greets me with a shoe! I bet it does, Kari. Shoes, socks, slippers, toys…so many gifts to choose from if you’re a dog. I’ve participated in the past – it’s lots of fun to read everyone’s answers. The answers are so interesting and it’s nice to learn a little more about our fellow bloggers. I hope you decide to participate this year. Ohh, thanks for reminding me!! I totally forgot about it this year! I was so bummed last year when I missed it. Looking forward to reading your post, Jenna! ? One tool I really like is Buffer for social media stuff since I read a lot in “batches.” I don’t want to overwhelm Twitter by sharing 5 posts an hour or however I end up reading them so I’ll schedule my favorites a few hours apart. I know it’s automation, but with the way I read I wouldn’t have a chance to share half of the stuff I do otherwise. I also love triberr.com. Sometimes I forget to share things to Twitter so it’s perfect for me. It’s a network where you upload your own blog posts, join some like minded tribes (there’s lots of dog ones) and you can share each other’s posts. It’s one of the ways I keep up to date with everyone’s posts and I love it. You’re so welcome for the shoutout, Jen and thanks so much for the tool tips. I use Buffer sometimes too but haven’t tried Triberr yet. I think we all have lots of material for those quirky posts too, lol! Glad you got to join the fun this year. It’s a great time to keep up with blogging friends. Aw thanks, Pamela! I’m glad I didn’t miss this year’s challenge and I’m hoping there’s a chance the Pet Blogger’s Gift Exchange might come back next year. That was a lot of fun! ? That’s great news, Pamela! 2015 was the first year I participated in the gift exchange and it was a lot of fun! Yes, that would be great! ? I’ll check in with you when it gets closer and see if we can’t meet up sometime during the Expo! ? great post, and I look forward to reading more of your posts in 2016! Thank you and I’m looking forward to reading some great posts on All Things Collie this year too! My favorite posts to write and to read are those ones about silly dog quirks, too! It’s nice to know I’m not the only one with a little dumpster diver in the family, either. Trash can visits are the only household manner fight Barley and I ever have! I couldn’t agree more with your comments about celebrating the small victories. There is so much that goes into running a blog that there will always be something else you feel like you should be doing. It is important to just do your best and enjoy the process! Good luck at the Pet Expo in the Spring! We have only been to 1 so far but it was a great experience. We made a lot of new contacts and came up with a lot of great content for the following several months! I definitely had to learn to enjoy the process, which was very frustrating at first. I guess we’re almost forced to do that because it seems we’re never caught up or never get a real sense of accomplishment or completion (except for the little things). Blogging has actually been very helpful to me in that respect because I’ve always been very task and goal driven and I’ve had to learn to accept that it’s okay if my “todo” list has items that have been waiting for months and sometimes I’m forced to post an article that maybe I’m not completely satisfied with, but it’s not the end of the world. It’s the perfect job for anyone that wants to drop their perfectionist tendencies, haha! ? Happy new year and congrats on your blog’s success! I always find your posts so helpful and also visually attractive for easy sharing, something I’d like to improve on. Thanks for the shutout. It means a lot. Thanks, Lindsay and a very Happy New Year to you too. I hope your 2016 is amazing! ? Great answers and advice here. This was my favorite, “If you’re a new blogger just getting started, it’s easy to feel overwhelmed because the truth is, there aren’t enough hours in the day to do everything we should be doing.” Ain’t that truth? I’m thinking this is my whole problem, there’s just so many things to do and not enough time. Blogging really should be a paid, full-time blog. Yes, it took me a little while to be comfortable with the feeling of being always overwhelmed and I had to learn how to be satisfied with small accomplishments since there’s never a feeling of being caught up or “done”, just done for the day, lol! Hey, there’s still time to get registered for sunny Orlando in March! What’s better than getting a break from the cold and snow to hang out with a lot of pet people? I hope you decide to go! ? I checked out a couple of your posts – the one about trash and growling and they are great! I like how you clearly outline the problem, why it happens, and what to do about it. I think things like this are really helpful for people, because so many people feel so lost in these situations, and you made it easy for them! Hey Elena! Thanks for checking out the blog and your super nice comments. I’m looking forward to getting to know you better this year because hiking and traveling are what we LOVE! ? Great post! I’m learning so much from this challenge. When it comes to time management, I’ve found that setting work hours and assigning specific tasks to days works best for me. I commute to work on the train, in the morning I respond to emails and share the blog post that published at 6:30am. In the afternoon, I respond to emails and read other blogs. On Sat and Sun, I spend a few hours writing/scheduling the following week’s blog post. In the evening, I curate content for my Facebook page and Twitter. Friday is my Pinterest day. That’s great advice, Kimberly. I think I need to get into the habit of sticking to a scheduled blogging routine. Also, maybe getting up one hour earlier in the morning might be a good idea. Thanks so much for participating in the Challenge! I enjoyed reading all your answers, and I’m hoping to be at Global again this year, too. We may have to try to schedule a group meeting so we can all put faces and names together. As for time management, I am certainly no expert, but I have found that using Buffer is a wonderful way to schedule all the things I want to share across social media. You can even provide different messages for the different platforms and see the analytics of how your posts have performed. Plus, you can add RSS feeds, so you can easily share some of your favorite bloggers posts, too. It costs $10 per month for the version with these options, but I’ve found it’s well worth the money. I hope that helps, and that you have a fantastic 2016! Thanks for the Buffer tip, Amy. I’ve used the free version and also Tweetdeck, but it sounds like the paid version might be worth the money. I’m so excited about the Global Pet Expo and having the chance to meet some of my fellow bloggers in person. We’ll have to see what we can get organized when it gets closer. Thanks again for hosting the challenge, great fun!? I love K9’s Over Coffee too! Looking forward to getting to know all my blogging buddies better! Thanks for stopping by! I love Haley’s face!! Aw, Haley says “thank you”, lol! Wishing you the best in 2016. ? Thanks for stopping by our blog. Looking forward to getting to know you and are heading back to read why my dog greets me with a toy! My female dogs have done this. Thanks for stopping by and come back to hang out with us anytime! This challenge is so fun! I’m getting to know all of you so much better & learning so much! I’ll put in on my calendar for next year! Isn’t it great, Denise? I’m so glad I remembered this year! Sitting down and scheduling posts once or twice a week, and setting aside a bit of time to comment and engage with other bloggers each evening helps me to manage my time. Social media is still something I struggle with! Yes, there are so many social media platforms now, you really have to pick what works for you and focus your energy there. I’m still trying to figure out what works the best, haha! Looking forward to reading many of your posts this year too! Thanks for stopping by my site and introducing yourself. Your blog is great! So glad you got to join in the Challenge this year. I wish I had some time management tips for you but I always feel like I’m spinning my wheels. I hope to get better at it this year. Time management seems to be the challenge trend this year. Maybe we’ll all make some headway this year and find new ways to become more productive! Thanks so much for stopping by, Dawn. ? Time management is a huge issue for everyone. You’re right, there are not enough hours in the day. What has helped me is prioritizing my social media channels so I know which ones I have to engage on if I’m short on time. I also LOVE Hootsuite. I have two Twitter accounts, and manage a few for clients, so it’s great that it allows me to monitor and engage with them all in one place. You can also view Instagram from Hootsuite and engage with your followers there. You can’t directly upload to IG from Hootsuite but you can schedule posts which automatically get transferred to your phone for easy posting. Good luck on your goals this year! Thanks for the great tips, Jessica! I’ve tried Hootsuite but only the free, limited version. The paid version may be worth the money since it would save a lot of time. Good luck this year too and I look forward to reading your upcoming hiking adventures! What a great post idea from Go Pet Friendly and I sadly missed the deadline but I’ll be sure to join in on the fun next year. I just love this pet blogging community, especially Blog Paws. So many wonderful and diverse people, it’s nice to see a mix of animal lovers and pet owners. Hey Linsday, So nice of you to stop by! I missed the challenge last year and I was so bummed, but it was still fun to read everyone’s posts. You’re so right about the blogging community, so many wonderful, helpful people. I’m looking forward to visiting your blog again soon. I know! I wish I had more time to really dive into all the wonderful articles from so many excellent blogs. I’ve added a lot of new bookmarks and blogs to my feedly account so I’ll be visiting yours again very soon! It’s been fun reading fellow Pet Blogger Challenges this year. We certainly have a lot in common, one of them being time-management questions. I’m willing to bet most of us are multi-taskers and that’s why we’re having management problems. I try (some days, anyway) to do one thing at a time, but it’s so darn hard. lol So much to do … too many thoughts in my head. All the best to you and your blog in the coming year. Peace. Yes, that’s exactly my problem, Jeanne! I’m always juggling multiple tasks and ideas in my head too. Someone mentioned getting a timer and using it for focusing on one task for a certain length of time. I think I’m going to give that a try! Great advice to new bloggers! Time management is a problem for most of us too. I wish I had a solution to that. Thanks! Another thing I’m going to try to get in the habit of doing is using the social media apps on my phone more when I have time to kill. That might be a good way to make use of all those minutes we waste waiting in line or waiting for doctor’s appointments, etc. I can so relate about never being able to get everything done in social media – oh my goodness, it’s overwhelming. Great answers – I’ve been loving these! Thanks, Lindsay! It was great to meet you through the Pet Blogger’s Challenge and I enjoyed checking out your blog. I look forward to more great posts and tips this year! Great insight and advice. I can definitely relate to feeling like there aren’t enough hours in the day. There are so many opportunities to explore and tools to check out, blogs to read, and things to share. Never mind just having the time to write! 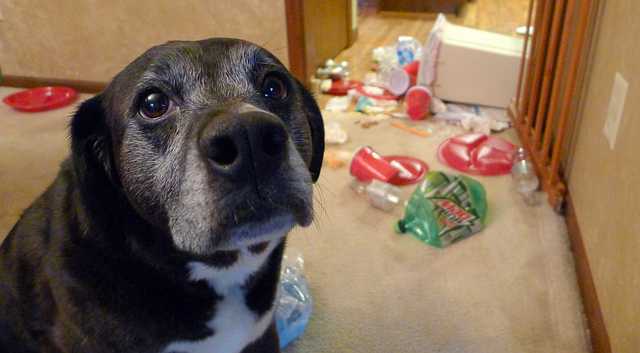 Love the photo with the trash…classic guilty face! Thank you, Kristen! Doesn’t it make you feel so bad when they have that look? Even when you’re mad at them, lol!